With a Bachelor of Fine Arts from the University of Akron and a scholarship from the Women's Art League, Linda began her professional journey into the arts. In the mid-70's, Linda worked for many advertising agencies in the Northeast Ohio region, winning numerous awards for her designs - especially logo designs. In the 90's, she opened her own design studio along with her partner, Kay Greenwald, where they specialized in corporate identity. 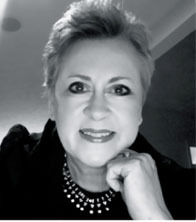 During this chapter in her life, she had the opportunity to design the interiors of Stride Rite shoe stores along with architect Jerry Herschmann. It must be noted that in the days of graphic design through the 70's to late 80's, computers were unheard of for graphic designers. Every logo, magazine ad and billboard needed to be illustrated by hand with markers and colored pencils. A single parent with three daughters, Linda chose the corporate route and began to work for the local newspaper as an artist. The Akron Beacon Journal was one of many Knight Ridder papers thoughout the country, including the Miami Herald and the Philadelphia Inquirer. Through the years, Linda received managerial and executive training by Knight Ridder. When the Internet hit the newspaper industry in 1995, she jumped on board to be one of eight General Managers of the Knight Ridder Digital websites, managing Ohio.com. She eventually became Vice President of Online Operations for the Akron Beacon Journal until she retired when the company was sold in 2008. Since then, Linda has gone back to exploring her deep-seated artist self, taking classes in various mediums including metal-smithing and jewelry-making. She has embraced her transition to chalk pastels because of her love for the fragility and timelessness of the medium. Very rarely does she use fixatives on her work, for it compromises the presentation and freshness of the pastel. She continually surrounds herself in color in everyday life, which is reflected in her work.